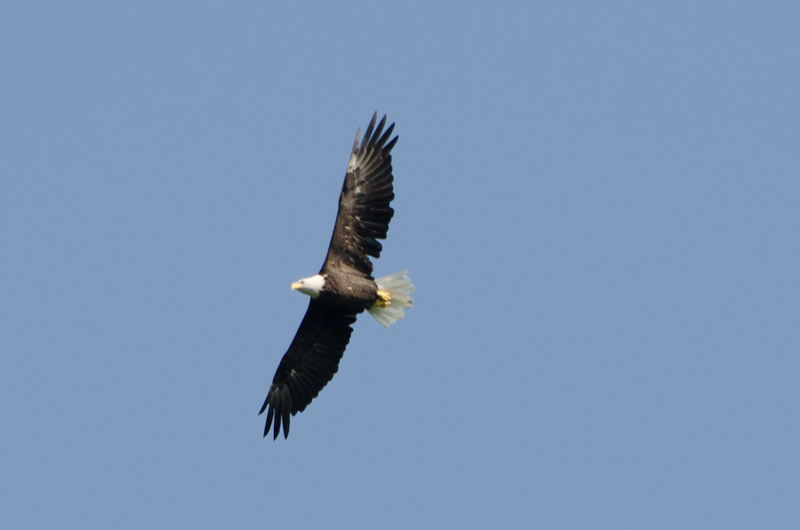 A bald eagle was spotted flying over the Bay this morning. Eagle calls could be heard later in the evening. If anyone spots the nesting grounds…give them a wide berth…and tell us all where to stay away from so we can continue to enjoy this majestic creature in our skies. The Bald Eagle is protected from being hunted or trapped throughout Ontario under the Fish and Wildlife Conservation Act. In southern Ontario, the eagle and its habitat are protected in regulation under Ontario’s Endangered Species Act, 2007. The Natural Heritage component of the Provincial Policy Statement under Ontario’s Planning Act provides for the protection of significant portions of the habitat of species listed in regulation under the E.S.A.. In addition, Ontario’s Conservation Land Tax Incentive Program (CLTIP) will provide 100% tax relief to private landowners for the portion of their property (minimum size 0.5 acres) determined to be habitat of species in regulation under the E.S.A. This program recognizes, encourages and supports private land stewardship. Bird Studies Canada, in cooperation with the Canadian Wildlife Service and Ontario Ministry of Natural Resources, monitors eagles in southwestern Ontario by counting the number of young successfully produced by each nesting pair, and by conducting pesticide analyses on blood samples from eaglets.